the wild horse project: Miro gets first ride today. So today Miro had his first official ride. 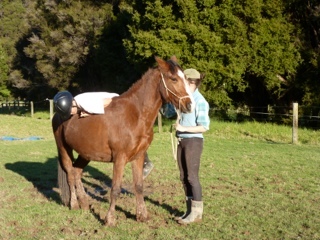 I sat on him once before but, today he was ridden properly. In typical Kaimanawa fashion he was wonderful. 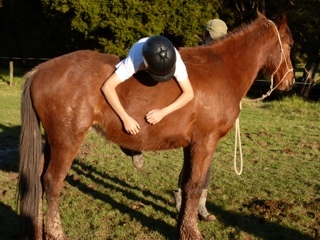 Horses are not complicated or difficult, its only us that make it that way. 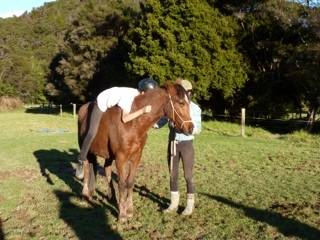 Breaking in, doesn't have to involve bucking, stress for the horse or anything magical. Timing and taking time are as always the key. This little wild stallion was happy and relaxed through the whole process. I had my working pupil around today and he was the one who actually got to ride, i was the one on the end of the rope controlling the horse. 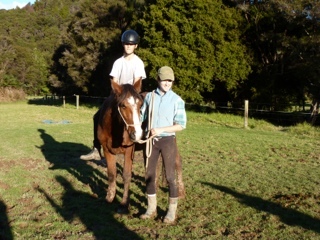 This little horse couldn't have been better behaved, everything went smoothly and here's the photo to show or it.